Asus is a bit sneaky on this one. With an original price rumored at $399, Asus has brought the Zenfone 3 Zoom (ZE553KL) to the US market with a price of $329 USD. If you’re from Canada it’s $479 CAD. Keep in mind that some US retailers ship to Canada and B&H.com (see info below) offer free shipping to Canada on orders over $99. It may be cheaper to buy out of the US for Canadians but the exchange rate is far from ideal right now. 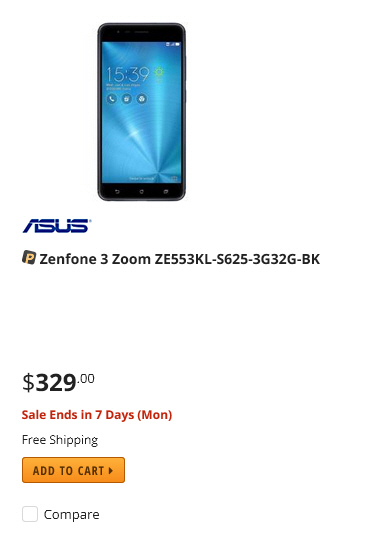 Canada shoppers need to be aware that this Zenfone 3 Zoom (ZE553KL) does NOT have the LTE band 66 which is required for 4G LTE on Freedom Mobile (Wind Mobile). You can of course use this on the Freedom Mobile 3G network. Something to note here is that it’s a different SKU than what was first rumored. So there is some compromise with the RAM and storage. Where there is no compromise is on the whopping 5,000mAh battery, the AMOLED display and the dual rear cameras. That’s a triple threat. So 1GB less RAM and 32GB storage rather than 64GB gets you a much cheaper device. In my view, it’s a winner. Price wins out. I think 4GB of RAM is relatively unproven as a necessity for most smartphone users. The storage situation isn’t a problem simply because keeping gigabytes of photos and video on an easily lost or stolen device is never a good thing. In addition you can make use of the expandable microSD card slot with up to 2TB more storage. In case you were wondering just how impressive the 5,000mAh battery is, Asus put out a head-to-head comparison against the almighty iPhone 7 Plus. The Zenfone 3 Zoom destroyed the iPhone in battery tests. This is a must watch if you are undecided about the Zenfone 3 Zoom. Watch the video here. If you want to shop, you can buy via the links below. If you are outside of the US or Canada, B&H offer international shipping which they pride themselves on. Of course check the network compatibility for your country!